In the double slit experiment, particles travelling through a pair of thin slits exhibit wave-like behavior, forming an interference pattern where they land that indicates that the particles in some sense travelled through both slits. Now, suppose that you place a single spin bit at the top slit, which starts off in the state |↑⟩ and flips to |↓⟩ iff a particle travels through the top slit. We fire off a single particle at a time, and then each time swap out that spin bit for a new spin bit that also starts off in the state |↑⟩. This serves as an extremely simple measuring device which encodes the information about which slit each particle went through. Now what will you observe on the screen? It turns out that you’ll observe the classically expected distribution, which is a simple average over the two individual possibilities without any interference. Okay, so what happened? Remember that the first pattern we observed was the result of the particles being in a superposition over the two possible paths, and then interfering with each other on the way to the detector screen. So it looks like simply having one bit of information recording the path of the particle was sufficient to collapse the superposition! But wait! Doesn’t this mean that the “consciousness causes collapse” theory is wrong? The spin bit was apparently able to cause collapse all by itself, so assuming that it isn’t a conscious system, it looks like consciousness isn’t necessary for collapse! Theory disproved! No. As you might be expecting, things are not this simple. For one thing, notice that this ALSO would prove as false any other theory of wave function collapse that doesn’t allow single bits to cause collapse (including anything about complex systems or macroscopic systems or complex information processing). We should be suspicious of any simple argument that claims to conclusively prove a significant proportion of experts wrong. But hold on! Our final result is identical to the classically expected result! We just get the probability of the particle getting to |j⟩ from |A⟩, multiplied by the probability of being at |A⟩ in the first place (50%), plus the probability of the particle going from |B⟩ to |j⟩ times the same 50% for the particle getting to |B⟩. In other words, our prediction is that we’d observe the classical pattern of a bunch of individual particles, each going through exactly one slit, with 50% going through the top slit and 50% through the bottom. The interference has vanished, even though we never assumed that the wave function collapsed! What this shows is that wave function collapse is not required to get particle-like behavior. All that’s necessary is that the different branches of the superposition end up not interfering with each other. And all that’s necessary for that is environmental decoherence, which is exactly what we had with the single spin bit! In other words, environmental decoherence is sufficient to produce the same type of behavior that we’d expect from wave function collapse. This is because interference will only occur between non-orthogonal branches of the wave function, and the branches become orthogonal upon decoherence (by definition). A particle can be in a superposition of multiple states but still act as if it has collapsed! Now, maybe we want to say that the particle’s wave function is collapsed when its position is measured by the screen. But this isn’t necessary either! You could just say that the detector enters into a superposition and quickly decoheres, such that the different branches of the wave function (one for each possible detector state) very suddenly become orthogonal and can no longer interact. And then you could say that the collapse only really happens once a conscious being observes the detector! Or you could be a Many-Worlder and say that the collapse never happens (although then you’d have to figure out where the probabilities are coming from in the first place). But hold on! This is forgetting a crucial fact: decoherence is reversible, while wave function collapse is not!!! Let’s say that you run the same setup before with the spin bit recording the information about which slit the particle went through, but then we destroy that information before it interacts with the environment in any way, therefore removing any traces of the measurement. Now the two branches of the wave function have “recohered,” meaning that what we’ll observe is back to the interference pattern! (There’s a VERY IMPORTANT caveat, which is that the time period during which we’re destroying the information stored in the spin bit must be before the particle hits the detector screen and the state of the screen couples to its environment, thus decohering with the record of which slit the particle went through). If you’re a collapse purist that says that wave function collapse = total decoherence (i.e. orthogonality of the relevant branches of the wave function), then you’ll end up making the wrong prediction! Why? Well, because according to you, the wave function collapsed as soon as the information was recorded, so there was no “other branch of the wave function” to recohere with once the information was destroyed! This has some pretty fantastic implications. Since IN PRINCIPLE even the type of decoherence that occurs when your brain registers an observation is reversible (after all, the Schrodinger equation is reversible), you could IN PRINCIPLE recohere after an observation, allowing the branches of the wave function to interfere with each other again. These are big “in principle”s, which is why I wrote them big. But if you could somehow do this, then the “Consciousness Causes Collapse” theory would give different predictions from Many-Worlds! If your final observation shows evidence of interference, then “consciousness causes collapse” is wrong, since apparently conscious observation is not sufficient to cause the other branches of the wave function to vanish. Otherwise, if you observe the classical pattern, then Many Worlds is wrong, since the observation indicates that the other branches of the wave function were gone for good and couldn’t come back to recohere. This suggests a general way to IN PRINCIPLE test any theory of wave function collapse: Look at processes right beyond the threshold where the theory says wave functions collapse. Then implement whatever is required to reverse the physical process that you say causes collapse, thus recohering the branches of the wave function (if they still exist). Now look to see if any evidence of interference exists. If it does, then the theory is proven wrong. If it doesn’t, then it might be correct, and any theory of wave function collapse that demands a more stringent standard for collapse (including Many-Worlds, the most stringent of them all) is proven wrong. We can use the concepts in information theory that I’ve been discussing recently to discuss the idea of optimal experimental design. The main idea is that when deciding which experiment to run out of some set of possible experiments, you should choose the one that will generate the maximum information. Said another way, you want to choose experiments that are surprising as possible, since these provide the strongest evidence. Suppose that you have a bunch of face-down cups in front of you. You know that there is a ping pong ball underneath one of the cups, and want to discover which one it is. You have some prior distribution of probabilities over the cups, and are allowed to check under exactly one cup. Which cup should you choose in order to get the highest expected information gain? The answer to this question isn’t extremely intuitively obvious. You might think that you want to choose the cup that you think is most likely to hold the ball, because then you’ll be most likely to find the ball there and thus learn exactly where the ball is. But at the same time, the most likely choice of ball location is also the one that gives you the least information if the ball is actually there. If you were already fairly sure that the ball was under that cup, then you don’t learn much by discovering that it was. Maybe instead the better strategy is to go for a cup that you think is fairly unlikely to be hiding the ball. Then you’ll have a small chance of finding the ball, but in that case will gain a huge amount of evidence. Or perhaps the maximum expected information gain is somewhere in the middle. The best way to answer this question is to actually do the calculation. So let’s do it! Xk corresponds to the observation that the ball is under the kth cup. Pk is shorthand for P(Ck) – the probability of Ck being true. Good! Now we are ready to calculate the expected information gain from any particular observation. Let’s say that we decide to observe X3. There are two scenarios: either we find the ball there, or we don’t. Scenario 1: You find the ball under cup 3. In this case, you previously had a credence of P3 in X3 being true, so you gain -log(P3) bits of information. Scenario 2: You don’t find the ball under cup 3. In this case, you gain –log(1 – P3) bits of information. With probability P3, you gain –log(P3) bits of information, and with probability (1 – P3) you gain –log(1 – P3) bits of information. So your expected information gain is just –P3 logP3 – (1 – P3) logP3. What does this function look like? We see that it has a peak value at 50%. This means that you expect to gain the most information by looking at a cup that you are 50% sure contains the ball. If you are any more or less confident than this, then evidently you learn less than you would have if you were exactly agnostic about the cup. Intuitively speaking, this means that we stand to learn the most by doing an experiment on a quantity that we are perfectly agnostic about. Practically speaking, however, the mandate that we run the experiment that maximizes information gain ends up telling us to always test the cup that we are most confident contains the ball. This is because if you split your credences among N cups, they will be mostly under 50%, so the closest you can get to 50% will be the largest credence. Even if you are 99% confident that the fifteenth cup out of one hundred contains the ball, you will have just about .01% credence in each of the others containing the ball. Since 99% is closer to 50% than .01%, you will stand to gain the most information by testing the fifteenth ball (although you stand to gain very little information in a more absolute sense). This generalizes nicely. Suppose that instead of trying to guess whether or not there is a ball under a cup, you are trying to guess whether there is a ball, a cube, or nothing. Now your expected information gain in testing a cup is a function of your prior over the cup containing a ball Pball, your prior over it containing a cube Pcube, and your prior over it containing nothing Pempty. Subject to the constraint that these three priors must add up to 1, what set of (Pball, Pcube, Pempy) maximizes the information gain? It is just (⅓, ⅓, ⅓). If you can only peek under a single cup, which one should you choose in order to learn the most possible? I take it that the answer to this question is not immediately obvious. But using these methods in information theory, we can answer this question unambiguously: Cup 1 is the best choice – the optimal experiment. Checking cup 1 is thus 0.33 bits better than checking cup 2, and 0.58 bits better than checking cup 3. Since receiving N bits of information corresponds to ruling out all but 1/2N possibilities, we rule out 20.33 ≈ 1.26 times more possibilities by checking cup 1 than cup 2, and 20.58 ≈ 1.5 times more possibilities than cup 3. Even more generally, we see that when we can test N mutually exclusive characteristics of an object at once, the test is most informative when our credences in the characteristics are smeared out evenly; P(k) = 1/N. This makes a lot of sense. We learn the most by testing things about which we are very uncertain. The more smeared out our probabilities are over the possibilities, the less confident we are, and thus the more effective a test will be. Here we see a case in which information theory vindicates common sense! Suppose you have some old distribution Pold, and you want to update it to a new distribution Pnew given some information. You want to do this in such a way as to be as uncertain as possible, given your evidence. One strategy for achieving this is to maximize the difference in entropy between your new distribution and your old one. Entropy is expected surprise. So this quantity is the new expected surprise minus the old expected surprise. Maximizing this corresponds to trying to be as much more surprised on average as possible than you expected to be previously. But this is not quite right. We are comparing the degree of surprise you expect to have now to the degree of surprise you expected to have previously, based on your old distribution. But in general, your new distribution may contain important information as to how surprised you should have expected to be. One minute ago, you had some set of beliefs about the world. This set of beliefs carried with it some degree of expected surprise. This expected surprise is not the same as the true average surprise, because you could be very wrong in your beliefs. That is, you might be very confident in your beliefs (i.e. have very low EXPECTED surprise), but turn out to be very wrong (i.e. have very high ACTUAL average surprise). That is to say, instead of using the simple difference in entropies S(Pnew) – S(Pold), you should be using the relative entropy Srel(Pnew, Pold). Here’s a diagram describing the three species of entropy: entropy, cross entropy, and relative entropy. As one more example of why this makes sense: imagine that one minute ago you were totally ignorant and knew absolutely nothing about the world, but were for some reason very irrationally confident about your beliefs. Now you are suddenly intervened upon by an omniscient Oracle that tells you with perfect accuracy exactly what is truly going on. If your new beliefs are designed by maximizing the absolute gain in entropy, then you will be misled by your old irrational confidence; your old expected surprise will be much lower than it should have been. If you use relative entropy, then you will be using your best measure of the actual average surprise for your old beliefs, which might have been very large. So in this scenario, relative entropy is a much better measure of your actual change in average surprise than the absolute entropy difference, as it avoids being misled by previous irrationality. A good way to put this is that relative entropy is better because it uses your current best information to estimate the difference in average surprise. While maximizing absolute entropy differences will give you the biggest change in expected surprise, maximizing relative entropy differences will do a better job at giving you the biggest difference in *actual* surprise. Relative entropy, in other words, allows you to correct for previous bad estimates of your average surprise, and substitute in the best estimate you currently have. These two approaches, maximizing absolute entropy difference and maximizing relative entropy, can give very different answers for what you should believe. It so happens that the answers you get by maximizing relative entropy line up nicely with the answers you get from just ordinary Bayesian updating, while the answers you get by maximizing absolute entropy differences, which is why this difference is important. I won’t rehash the justification for this equation, but highly recommend you check out the previous post if this seems unusual to you. As we saw previously, the total expected surprise for a distribution is synonymous with the entropy of somebody with that distribution. Which leads us straight into the topic of this post! The entropy of a distribution is how surprised we expect to be if we suddenly learn the truth about the distribution. It is also the amount of information we expect to gain upon learning the truth. A small degree of entropy means that we expect to learn very little when we hear the truth. A large degree of entropy means that we expect to gain a lot of information upon hearing the truth. Therefore a large degree of entropy represents a large degree of uncertainty. Entropy is our distance from certainty. Notice that this is not the distance from truth. We can be very certain, and very wrong. In this case, our entropy will be high, because it is our expected surprise. That is, we calculate entropy by looking at the average surprise over our probability distribution, not the true distribution. If we want to evaluate the distance from truth, we need to evaluate the average over the true distribution. We can do this by using cross-entropy. In general, the cross entropy is a function of two distributions P and Q. The cross entropy of P and Q is the surprise you expect somebody with the distribution Q to have, if you have distribution P.
The actual average surprise of your distribution P is therefore the cross-entropy between P and the true distribution. It is how surprised somebody would expect you to be, if they had perfect knowledge of the true distribution. Notice that the smallest possible value that the cross entropy could take on is the entropy of the true distribution. This makes sense – if your distribution is as close to the truth as possible, but the truth itself contains some amount of uncertainty (for example, a fundamentally stochastic process), then the best possible state of belief you could have would be exactly as uncertain as the true distribution is. Maximum cross entropy between your distribution and the true distribution corresponds to maximum distance from the truth. If we want a quantity that is zero when your distribution is equal to the true distribution, then you can shift the cross entropy H(Ptrue, P) over by the value of the true entropy S(Ptrue). This new quantity H(Ptrue, P) – S(Ptrue) is known as the Kullback-Leibler divergence. It represents the information gap, or the actual average difference in difference between your distribution and the true distribution. The smallest possible value of the Kullback-Leibler divergence is zero, when your beliefs are completely aligned with reality. Since KL divergence is just a constant shift away from cross entropy, minimizing one is the same as minimizing the other. This makes sense; the only real difference between the two is whether we want our measure of “perfect accuracy” to start at zero (KL divergence) or to start at the entropy of the true distribution (cross entropy). The negative KL divergence is just a special case of what’s called relative entropy. The relative entropy of P and Q is just the negative cross entropy of P and Q, shifted so that it is zero when P = Q. Since the cross entropy between P and Q measures how surprised P expects Q to be, the relative entropy measures P’s expected gap in average surprisal between themselves and Q.
KL divergence is what you get if you substitute in Ptrue for P. Thus it is the expected gap in average surprisal between a distribution and the true distribution. Maximum KL divergence corresponds to maximum distance from the truth, while maximum entropy corresponds to maximum from certainty. This is why we maximize entropy, but minimize KL divergence. The first is about humility – being as uncertain as possible given the information that you possess. The second is about closeness to truth. Since KL divergence is just a constant shift away from cross entropy, minimizing one is the same as minimizing the other. This makes sense, the only real difference between the two is whether we want our “perfectly accurate” measure to start at zero (KL divergence) or at the entropy of the true distribution (cross entropy). Since we don’t start off with access to Ptrue, we can’t directly calculate the cross entropy H(Ptrue, P). But lucky for us, a bunch of useful approximations are available! Log loss uses the fact that if we have a set of data D generated by the true distribution, the expected value of F(x) taken over the true distribution will be approximately just the average value of F(x), for x in D.
This approximation should get better as our data set gets larger. Log loss is thus just a large-numbers approximation of the actual expected surprise. Often we want to use our data set D to optimize our distribution P with respect to some set of parameters. If we do this, then the log loss estimate is biased. Why? Because we use the data in two places: first to optimize our distribution P, and second to evaluate the information distance between P and the true distribution. This allows problems of overfitting to creep in. A distribution can appear to have a fantastically low information distance to the truth, but actually just be “cheating” by ensuring success on the existing data points. The Akaike information criterion provides a tweak to the log loss formula to try to fix this. It notes that the difference between the cross entropy and the log loss is approximately proportional to the number of parameters you tweaked divided by the total size of the data set: k/N. The explicit inclusion of k, the number of parameters in your model, represents an explicit optimization for simplicity. The derivation of AIC relies on a complicated set of assumptions about the underlying distribution. These assumptions limit the validity of AIC as an approximation to cross entropy / KL divergence. But there exists a different set of techniques that rely on no assumptions besides those used in the log loss approximation (the law of large numbers and the assumption that your data is an unbiased sampling of the true distribution). Enter the holy grail of model selection! The problem, recall, was that we used the same data twice, allowing us to “cheat” by overfitting. First we used it to tweak our model, and second we used it to evaluate our model’s cross entropy. Cross validation solves this problem by just separating the data into two sets, the training set and the testing set. The training set is used for tweaking your model, and the testing set is used for evaluating the cross entropy. Different procedures for breaking up the data result in different flavors of cross-validation. There we go! These are some of the most important concepts built off of entropy and variants of entropy. What is the optimal algorithm for discovering the truth? There are many different candidates out there, and it’s not totally clear how to adjudicate between them. One issue is that it is not obvious exactly how to measure correspondence to truth. There are several different criterion that we can use, and in this post, I want to talk about three big ones: accommodation, prediction, and simplicity. The basic idea of accommodation is that we want our theories to do a good job at explaining the data that we have observed. Prediction is about doing well at predicting future data. Simplicity is, well, just exactly what it sounds like. Its value has been recognized in the form of Occam’s razor, or the law of parsimony, although it is famously difficult to formalize. Now, our goal is to fit a curve to this data. How best to do this? Curve 1 is generated by Procedure 1: Find the lowest-order polynomial that perfectly matches the data. Curve 2 is generated by Procedure 2: Find the straight line that best fits the data. If we only cared about accommodation, then we’ll prefer Curve 1 over Curve 2. After all, Curve 1 matches our data perfectly! Curve 2, on the other hand, is always close but never exactly right. On the other hand, regardless of how well Curve 1 fits the data, it entirely misses the underlying pattern in the data captured by Curve 2! This demonstrates one of the failure modes of a single-minded focus on accommodation: the problem of overfitting. We might want to solve in this problem by noting that while Curve 1 matches the data better, it does so in virtue of its enormous complexity. Curve 2, on the other hand, matches the data pretty well, but does so simply. A combined focus on accommodation + simplicity might, therefore, favor Curve 2. Of course, this requires us to precisely specify what we mean by ‘simplicity’, which has been the subject of a lot of debate. For instance, some have argued that an individual curve cannot be said to be more or less simple than a different curve, as just rephrasing the data in a new coordinate system can flip the apparent simplicity relationship. This is a general version of the grue-bleen problem, which is a fantastic problem that deserves talking about in a separate post. Another way to solve this problem is by optimizing for accommodation + prediction. The over-fitted curve is likely to be very off if you ask for predictions about future data, while the straight line is likely going to do better. This makes sense – a straight line makes better forecasts about future data because it has gotten to the true nature of the underlying relationship. What if we want to ensure that our model does a good job at predicting future data, but are unable to gather future data? For example, suppose that we lost the coin that we were using to generate the data, but still want to know what model would have done best at predicting future flips? Cross-validation is a wonderful technique that can be used to deal with exactly this problem. We can see that while the new Curve 2 does roughly as well as it did before, the new Curve 1 will do horribly on the testing set. We now do this for many different ways of splitting up our data set, and in the end accumulate a cross-validation “score”. This score represents the average success of the model at predicting points that it was not trained on. We expect that in general, models that overfit will tend to do horribly badly when asked to predict the testing data, while models that actually get at the true relationship will tend to do much better. This is a beautiful method for avoiding overfitting by getting at the deep underlying relationships, and optimizing for the value of predictive accuracy. It seems like predictive accuracy and simplicity often go hand-in-hand. In our coin example, the simpler model (the straight line) was also the more predictively accurate one. And models that overfit tend to be both bad at making accurate predictions and enormously complicated. What is the explanation for this relationship? One classic explanation says that simpler models tend to be more predictive because the universe just actually is relatively simple. For whatever reason, the actual relationships between different variables in the universe happens to be best modeled by simple equations, not complicated ones. Why? One reason that you could point to is the underlying simplicity of the laws of nature. 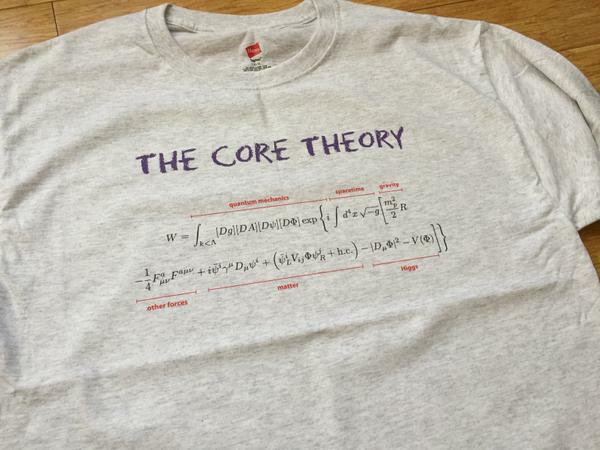 The Standard Model of particle physics, which gives rise to basically all of the complex behavior we see in the world, can be expressed in an equation that can be written on a t-shirt. In general, physicists have found that reality seems to obey very mathematically simple laws at its most fundamental level. I think that this is somewhat of a non-explanation. It predicts simplicity in the results of particle physics experiments, but does not at all predict simple results for higher-level phenomenon. In general, very complex phenomena can arise from very simple laws, and we get no guarantee that the world will obey simple laws when we’re talking about patterns involving 1020 particles. An explanation that I haven’t heard before references possible selection biases. The basic idea is that most variables out there that we could analyze are likely not connected by any simple relationships. Think of any random two variables, like the number of seals mating at any moment and the distance between Obama and Trump at that moment. Are these likely to be related by a simple equation? Of course! The only times when we do end up searching for patterns in variables is when we have already noticed that some pattern does plausibly seem to exist. And since we’re more likely to notice simpler patterns, we should expect a selection bias among those patterns we’re looking at. In other words, given that we’re looking for a pattern between two variables, it is fairly likely that there is a pattern that is simple enough for us to notice in the first place. Regardless, it looks like an important general feature of inference systems to provide a good balance between accommodation and either prediction or simplicity. So what do actual systems of inference do? I’ve already talked about cross validation as a tool for inference. It optimizes for accommodation (in the training set) + prediction (in the testing set), but not explicitly for simplicity. Updating of beliefs via Bayes’ rule is a purely accommodation procedure. When you take your prior credence P(T) and update it with evidence E, you are ultimately just doing your best to accommodate the new information. The theory that receives the greatest credence bump is going to be the theory that maximizes P(E | T), or the likelihood of the evidence given the theory. This is all about accommodation, and entirely unrelated to the other virtues. Technically, the method of choosing the theory that maximizes the likelihood of your data is known as Maximum Likelihood Estimation (MLE). On the other hand, the priors that you start with might be set in such a way as to favor simpler theories. Most frameworks for setting priors do this either explicitly or implicitly (principle of indifference, maximum entropy, minimum description length, Solomonoff induction). Leaving Bayes, we can look to information theory as the foundation for another set of epistemological frameworks. These are focused mostly on minimizing the information gain from new evidence, which is equivalent to maximizing the relative entropy of your new distribution and your old distribution. Two approximations of this procedure are the Akaike Information Criterion (AIC) and the Bayesian Information Criterion (BIC), each focusing on subtly different goals. Both of these explicitly take into account simplicity in their form, and are designed to optimize for both accommodation and prediction. Some of the procedures I’ve included are closely related to others, and in some cases they are in fact approximations of others (e.g. minimize log loss ≈ maximize relative entropy, minimize AIC ≈ minimize log loss). We can see in this table that Bayesianism (Bayesian updating + a prior-setting procedure) does not explicitly optimize for predictive value. It optimizes for simplicity through the prior-setting procedure, and in doing so also happens to pick up predictive value by association, but doesn’t get the benefits of procedures like cross-validation. This is one reason why Bayesianism might be seen as suboptimal – prediction is the great goal of science, and it is entirely missing from the equations of Bayes’ rule. On the other hand, procedures like cross validation and maximization of relative entropy look like good candidates for optimizing for accommodation and predictive value, and picking up simplicity along the way.